FILE - Iraqi soldiers train with members of the U.S. Army 3rd Brigade Combat Team, 82nd Airborne Division, at Camp Taji, Iraq, in this U.S. Army photo released June 2, 2015. The U.S. military chief said Thursday the United States is considering creating more train-and-advise hubs for Iraqi troops, even as it prepares to open a new base in Anbar province with 450 military personnel. 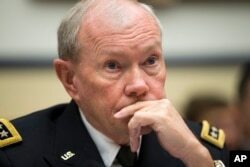 "It's another one of the options that we're considering," General Martin Dempsey, chairman of the Joints Chiefs of Staff, told reporters in Naples, Italy, where he is meeting with U.S. commanders. FILE - Joint Chiefs Chairman Gen. Martin Dempsey, Nov. 13, 2014. Dempsey said examination of other sites beyond the new one in Taqqadum near Ramadi, the provincial capital overrun by Islamic State insurgents last month, is "just part of prudent planning." The military leader said he does not foresee another hub in Anbar, but possibly one in the corridor north of the capital, Baghdad, extending toward Mosul, Iraq's second city that the militants seized a year ago. The U.S. plans to deploy the new advisers within six to eight weeks, part of an effort to bolster Iraqi ground troops. Since last September, a U.S.-led coalition had conducted 4,400 aerial strikes on Islamic State positions in Iraq and Syria, but U.S. President Barack Obama has ruled out sending American ground troops. At Taqqadum, U.S. forces will advise the 8th Iraqi army division on "how best to deploy their troops" and improve logistics and intelligence, Pentagon spokesman Colonel Steve Warren said Wednesday. They will also work to connect Sunni tribes in Anbar with the Iraqi government in a bid to help add Sunni militias to the pro-government forces now fighting the Islamic State. The White House announced the mission Wednesday, saying Obama had consulted with Iraqi Prime Minister Haider al-Abadi and that the move is in line with Abadi's "request and desire for additional assistance." The new personnel will join 3,100 U.S. troops already training and advising Iraqi forces at four other sites around the country. None of the American forces are taking part in ground combat. "Ultimately, you've heard the president say many times that there have to be local solutions to taking back this territory and holding it and that the U.S. military cannot do this simply for Iraqis," Deputy National Security Advisor Ben Rhodes said. "And frankly, Iraqis want to be in the lead themselves." "The [White House] decision is quite good step for us as an indication for the will and a serious desire of United States in this fight against the Islamic State," Salim al-Jabouri, Speaker of the Iraqi Parliament, told VOA on Thursday. "But obviously it is not at a level [nearing] final victory in this war, so the Iraqis are willing [to accept] more assistance and solidarity of the international community and specifically from the United State of America." RAND Corporation senior political scientist and former career Army officer Rick Brennan told VOA that the new effort is a step in the right direction, but does not include nearly enough forces to achieve the president's goals. "I think today, if you were to get an honest appraisal from those who are doing the planning in Iraq, they would also tell you 3,500 is woefully inadequate to do the types of missions that you're talking about, degrading and destroying ISIS, helping the Iraqis do it, but more importantly helping other partners in the region do it," Brennan said. He also said that advising only Iraqi forces does not address the issue of the Islamic State group's reach beyond Iraq into its strongholds in Syria and threats further away in places like Libya. "This is a growing strategic threat that is much larger than just Iraq, and the United States does not have an overarching strategy for how we're going to deal with this threat either in the short term of the long term," he said. Republican critics of Obama, a Democrat, also said the new effort does not go far enough. Senator Lindsey Graham told VOA the new advisers are "just adding capacity to a strategy that will never work" and that there will be too few to make a difference. Senator John McCain has repeatedly called for U.S. ground forces to return to Iraq, which Obama withdrew in 2011 at the end of the country's eight-year war in the country that toppled Iraqi President Saddam Hussein.